If you’d like me to mention your free (limited-period) eBook in the Monday evening post, click here. April 11th 2011: What do you get out of a writing group? and then NaPoWriMo – a new one on me. April 16th: When is a classic not (necessarily) a classic?. April 19th: A few rules when writing and then The much underrated short story. April 22nd: Leaving your writing to stew. April 25th: What is the average book deal structure for a first time fiction writer?. April 30th: How to write a 28-word story. May 10th: If you’re suffering from writer’s block – try a word web. June 11th: What’s in a name?. October 29th: Are you ready for NaNoWriMo?. Tuesday 17th January 2012: writing essentials. Thursday 2nd February: writing rituals, or in my case the lack of them. Thursday 9th February: second-person point of view (my favourite!). Thursday 8th March: writing groups. Tuesday 13th March: April’s 100 pages of script in a month project Script Frenzy. Tuesday 1st May: I talked about a new site I’ve devised to create blogs for other writers. Thursday 7th June: what’s missing (negatives in fiction). Sunday 8th July: building a blog for novelist Jane Wenham-Jones. Sunday 19th August: my trip to St Hilda’s Writing Conference part 1. Sunday 26th August: my trip to St Hilda’s Writing Conference part 2. Wednesday 6th March 2013: How To Write a 28-word Story. Wednesday 3rd April: Computer tips (part 1). Wednesday 10th April: Computer tips (part 2). Thursday 23rd May: I talked about my recent visit to the Second Greenacre Writers Literature Festival. Sunday 23rd June: I blogged about a recent author talk by crime novelists Peter Tickler and Stephen Booth. Sunday 30th June: I talked about the June 2013 BeaconLit literature festival here. Sunday 7th July: I reviewed the site Grammarly.com. Tuesday 30th July: August-deadline writing competitions. Tuesday 6th August: I blogged the NLG Flash Fiction Competition 2013 Results. Thursday 15th August: I talked about Jane Wenham-Jones‘ new Wannabe a Writer TV show! Tuesday 17th September: I blogged about my weekend at booQfest: part 1 and part 2. Tuesday 15th October: Writing 101 – writing tips. Thursday 17th October: November-deadline Writing Competitions. Sunday 1st December: I blogged about O Henry. My #NaNoWriMo Nov 2013: 46,000 words in 6 days. Monday 30th December 2013: I talked about what I’d been up to (writing-related) in the past week as well as anything that caught my eye on the social networks in Morgen’s Monday Musings 001 – guesting, courses, and what’s caught my eye online. 6th January 2014: I talked about what I’ve been up to (writing-related) in the past week as well as anything that caught my eye in MMM 002. 13th January: I talked about what I’ve been up to (writing-related) in the past week as well as anything that caught my eye in MMM 003. 14th January: I blogged about character names. 20th January: I talked about what I’ve been up to in the past week as well as anything that caught my eye in MMM 004. 27th January: I talked about what I’ve been up to in the past week as well as anything that caught my eye in MMM 005. 3rd February: I talked about what I’ve been up to in the past week as well as anything that caught my eye in MMM 006. 17th February: I talked about what I’ve been up to in the past week as well as anything that caught my eye in MMM 007. 24th February: I talked about what I’ve been up to in the past week as well as anything that caught my eye in MMM 008. 3rd March: I talked about what I’ve been up to in the past week as well as anything that caught my eye in MMM 009. 10th March: I talked about what I’ve been up to in the past week as well as anything that caught my eye in MMM 010. 17th March: I talked about what I’ve been up to in the past week as well as anything that caught my eye in MMM 011. 24th March: I talked about what I’ve been up to in the past week as well as anything that caught my eye in MMM 012. 7th April: I talked about what I’ve been up to (writing-related) in the past week as well as anything that caught my eye in MMM 013. 21st April: I talked about what I’ve been up to in the past week as well as anything that caught my eye in MMM 014. 28th April: I talked about what I’ve been up to in the past week as well as anything that caught my eye in MMM 015. 5th May: I talked about what I’ve been up to in the past week as well as anything that caught my eye in MMM 016. 9th Feb: I shall be talking about what I’ve been up to in the past week as well as anything that caught my eye in MMM 017. 16th Feb: I shall be talking about what I’ve been up to in the past week as well as anything that caught my eye in MMM 018. 23rd Feb: I shall be talking about what I’ve been up to in the past week as well as anything that caught my eye in MMM 019. I welcome items for critique directly (see Editing & Critique) or for posting on the online writing groups. We look forward to reading your comments. Ah, thank you, Terry. Long time no speak. Do you fancy guesting for me again? 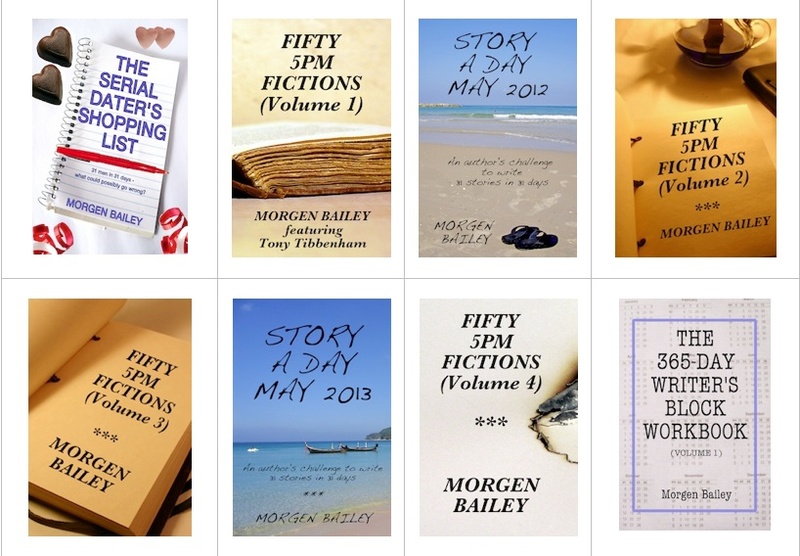 Lots to choose from on https://morgenbailey.wordpress.com/submission-information/opportunities-on-this-blog.